Work: Admitted to Philadelphia Bar, 1753; Attorney General (in Delaware), 1761; Member of Delaware Committee of Correspondence, 1774; Elected to Continental Congress, 1774-1776; Member of Delaware Constitutional Convention, 1776; Acting Governor of Delaware, 1777; Judge, Court of Appeals, 1780; State Senator 1791, 92; Chief Justice of the State of Delaware, 1793-98. 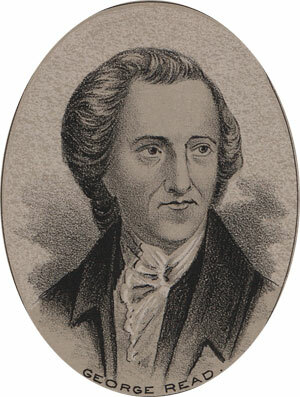 George Read was born on his family farm near North East, Cecil County, Maryland in 1733. He attended a school in Chester, Pennsylvania then the Philadelphia Academy under Doctor Allison at New London. At fifteen he graduated and proceeded to study law at the office of John Moland in Philadelphia. He was admitted to the Philadelphia Bar in 1753. He moved to New Castle Delaware to establish a new practice the following year. He established quite a reputation there and was appointed Attorney-general to three Delaware counties, an office which he resigned in 1774 when he was elected to the first Continental Congress. In 1764, the period leading up to the stamp act protests, Read had joined the Delaware Committee of Correspondence and was active in the patriot movement. At the Continental Congress he found Lee’s Resolution for Independence to be too hasty and voted against it. When it was adopted, however, he joined the majority in working toward independence. In 1776 Read was called upon to join the Constitutional Convention in Delaware, where he served as president of the committee that drafted the document. In 1777 the British captured Delaware governor John McKinly and Read took over as governor in the emergency. He lead the state through the crisis of the war, raising money, troops, and supplies for the defense of his state. In 1779 he suffered a bout of poor health and had to retire from official duties. He recovered, however, and was appointed Judge in Court of Appeals in admiralty cases three years later. Read went on to be twice elected State Senator under the new constitution, and later still was appointed Chief Justice of the State of Delaware. He served in that office until his death in 1798.